Wilfrid Laurier University students can channel their passion for social justice, civic engagement and sustainability into a career through the School of International Policy and Governance (SIPG). 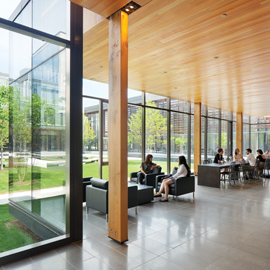 The school resides within the Balsillie School of International Affairs (BSIA), which is an institute for advanced research, education and outreach in the fields of global governance and international public policy. The BSIA brings together academic programs and faculty from Laurier and the University of Waterloo, as well as in-house expertise and a worldwide network of practitioners from the Centre for International Governance Innovation (CIGI) – an independent, non-partisan think tank focused on international governance. The BSIA is housed on the CIGI Campus in Waterloo. Together, these three institutions are able to guide the BSIA’s outreach and collaborative research on topics ranging from migration and food security to environment and global health policy. The School of International Policy and Governance is positioned within the BSIA to connect Laurier students, at both undergraduate and graduate levels, with leading researchers in their fields of international policy and governance. James Orbinski, a humanitarian health practitioner who led Médecins Sans Frontières (Doctors Without Borders), and Alan Whiteside, a leading scholar on the HIV/AIDS epidemic in Africa, currently serve as professors at Laurier’s School of International Policy and Governance and as CIGI Chairs in Global Health Governance and Policy. Laurier undergraduate students can now gain access to these experts while preparing for a career in government and public policy by enrolling in the new International Policy Option, offered by the School of International Policy and Governance. Students interested in complex global problems such as climate change, health and disease, crime, welfare, trade, and finance would find the option valuable. The option requires students to take a core course on International Policy at the BSIA campus, along with pre-requisites from other departments including economics, political science and global studies. This fall, the Integrative Seminar in International Policy (IP300) is being led by Geography and Environmental Studies Professor Alison Blay-Palmer and explores policy case studies related to food security, integrated food systems, genetically modified seeds, intellectual property rights and technology. The option would also give undergraduate students all the prerequisites needed to enrol in Laurier’s Masters of International Public Policy (MIPP). The MIPP program is a professional 12-month program that can lead to employment in policy analysis and programming positions in government and non-government institutions. MIPP alumni have found employment in all levels of government, international non-governmental organizations (NGOs) and multilateral organizations. SIPG also offers a joint PhD program in Global Governance, a unique opportunity for interdisciplinary examination of power and authority in the global arena. In this program, students examine a variety of actors, institutions, ideas, rules and processes that contribute to addressing the challenges of global governance. The School of International Policy and Governance continues to look for additional opportunities to connect Laurier students with global experiences. In September, the school hosted the Internationalization Expo at the BSIA where students met with NGOs and consular representatives to discover international work, volunteer and study abroad options available to them. Find more information about the School of International Policy and Governance or contact Margaret Walton-Roberts, associate dean at mwaltonroberts@wlu.ca, or Kelly Brown, program officer, at kbrown@wlu.ca.